Steve Bogaerts cave diving in sidemount tank configuration using the Razor Harness. 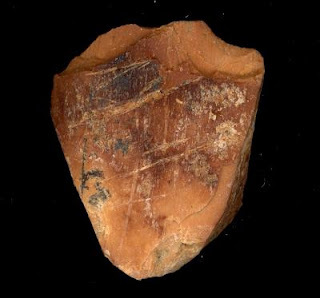 This is a bone from the Qesem Cave in Israel showing irregular cutmarks. Contestants on TV shows like Top Chef and Hell's Kitchen know that their meat-cutting skills will be scrutinized by a panel of unforgiving judges. Now, new archaeological evidence is getting the same scrutiny by scientists at Tel Aviv University and the University of Arizona. Their research is providing new clues about how, where and when our communal habits of butchering meat developed, and they're changing the way anthropologists, zoologists and archaeologists think about our evolutionary development, economics and social behaviors through the millennia. Presented in the Proceedings of the National Academy of Science, new finds unearthed at Qesem Cave in Israel suggest that during the late Lower Paleolithic period (between 400,000 and 200,000 years ago), people hunted and shared meat differently than they did in later times. Instead of a prey's carcass being prepared by just one or two persons resulting in clear and repeated cutting marks –– the forefathers of the modern butcher ― cut marks on ancient animal bones suggest something else.